Brennan Williams believes boxing gyms belong under bridges. So that’s where he put his new Sugarrays Boxing and Fitness Club. Brennan Williams takes a break in the custom-built ring at his new Sugarray’s Boxing Gym on Front Street. Well, not quite a bridge. But the east end of Front Street where the remaining bulk of the old concrete parkade blocks out the sun and locks in the noise of passing trucks. There’s no place Williams, who grew up in Burnaby but has deep family roots in the Royal City going back three generations, would rather be. 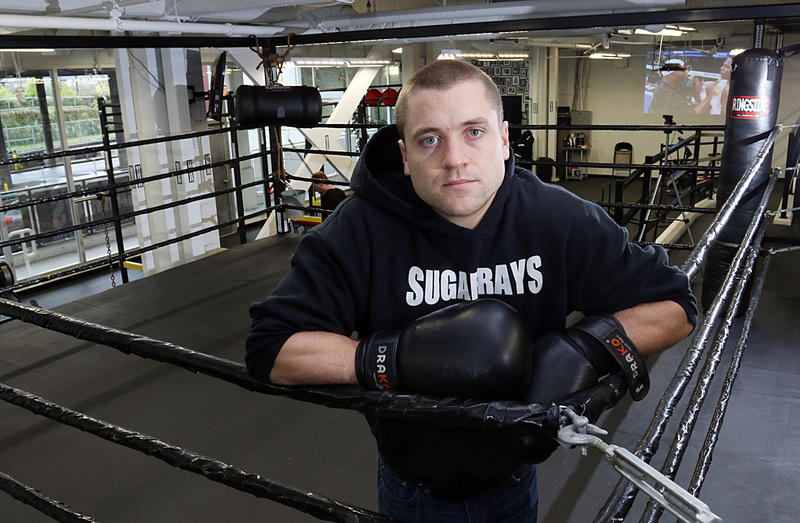 Brennan Williams grew up in Burnaby but he has deep family roots in New Westminster, so he had no doubts where he wanted to locate his second Sugarray’s Boxing Gym. “New West has an old history,” says Williams. Perfect for pugilists. Even if it’s just a memory of watching a Rocky movie. Sugarrays has been a part of Vancouver’s boxing scene for more than 16 years, first on Granville Street downtown and currently in Kitsilano. Williams, who learned the sweet science at the gym under legendary coach Bob McAdam and now passes on his knowledge to prospective boxers aged 16-60, had no doubt where he wanted to locate Sugarrays second facility. He was tiring of the long commute into Vancouver. Sugarrays New Westminster gym opened Oct. 1 at 425 Front St. after months of construction, including the installation of a custom-built ring, dozens of heavy and speed bags, a weight station and spin bikes. A projector beams boxing matches on a whitewashed cinderblock wall, a collage of framed black and white photos of famous and unknown boxers looms over the reception counter. The 3,000 square foot gym doesn’t yet have the worn-in sweat and spit ambiance of a classic old-time boxing gym; that mostly exists outside the front door, beneath the hulking parkade. Williams says the gym is in the business of training fighters, but there’s no requirement to face an opponent in the 15-foot training ring. The boxer’s fitness regime is what attracts most members. 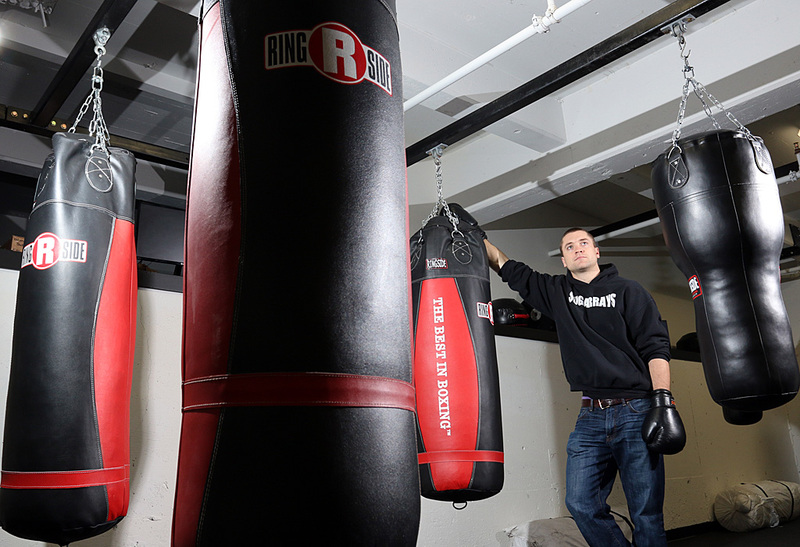 Brennan Williams, of Sugarray’s Boxing Gym, says a boxer’s training workout can be grueling. 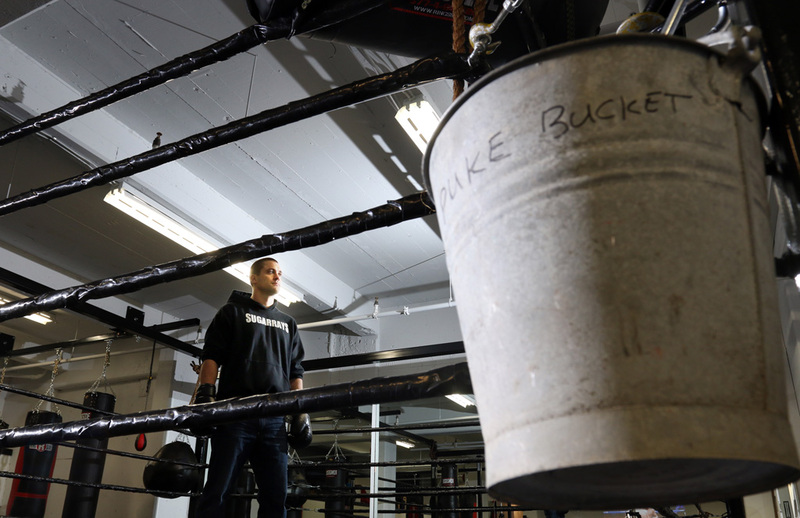 That may explain the puke bucket hanging in a corner of the gym’s custom-built ring. 10 rounds of pounding the various leather bags. Sugarrays is open seven days a week; 2 – 10 pm on weekdays, 10 am – 3 pm on weekends.